The cornea is the window of the eye. Light travels through the cornea, past the lens to the retina, and then to the brain to form a visual image. The normal corneal surface is smooth and aspheric (round in the center), and flattened towards its outer edges. Light rays passing through the cornea move in an undistorted manner to the retina and project a clear image to the brain. 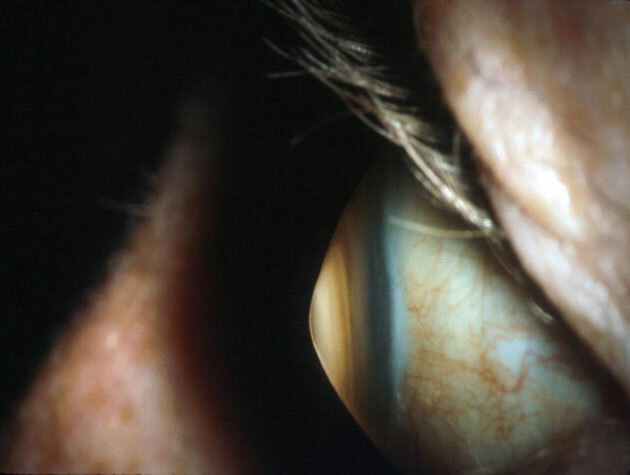 In patients with keratoconus, the cornea is cone-shaped; hence, the name “keratoconus,” which is derived from the Greek word for cornea (“kerato”) and cone-shaped (“conus”). 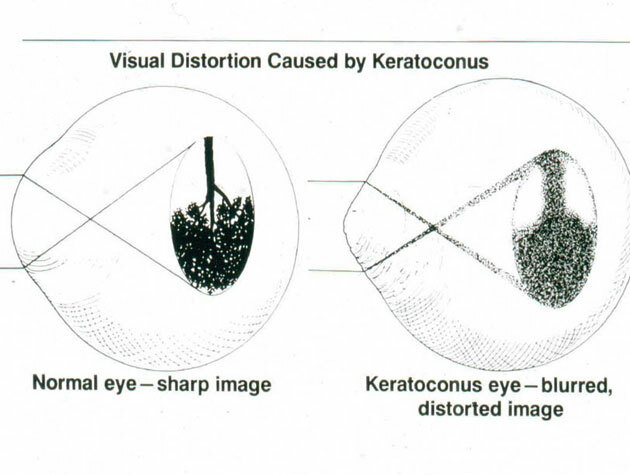 In patients with keratoconus, the cornea is not only cone-shaped, but the surface is also irregular, resulting in a distorted image being projected to the brain. Because the cornea is irregular and cone-shaped, glasses do not adequately correct vision because they cannot conform to the shape of the eye. Patients with keratoconus see best with rigid contact lenses, because these lenses provide a clear surface in front of the cornea that allows light rays to be projected clearly to the retina; hence, the vast majority of patients are treated with rigid contact lenses. There are, however, some excellent new surgical options for patients who cannot tolerate rigid contacts. 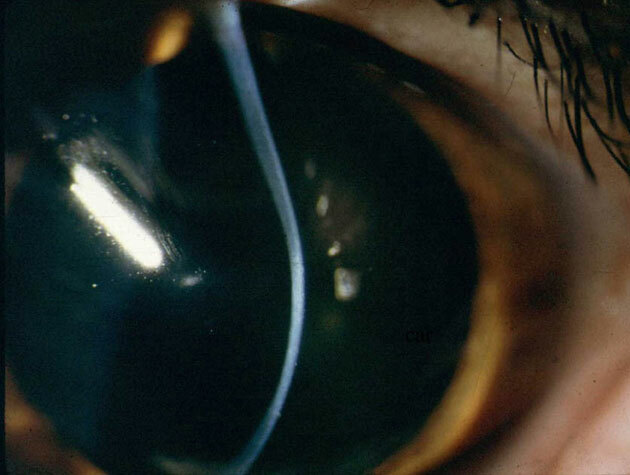 These options are discussed in the section on treatments for keratoconus. 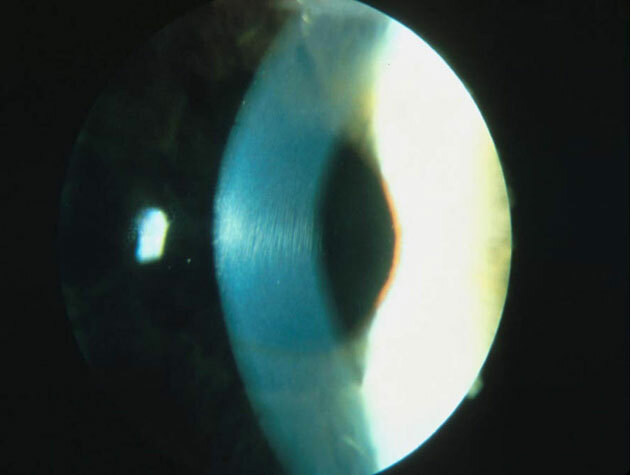 Many patients are initially unaware they have keratoconus. They go to their eye doctor because of increasing spectacle blur or progressive changes in their prescription. In many instances, even a good refraction yields poor vision. Keratoconus is most often diagnosed by a cornea specialist who can see typical findings when examining the patient at the slit-lamp. 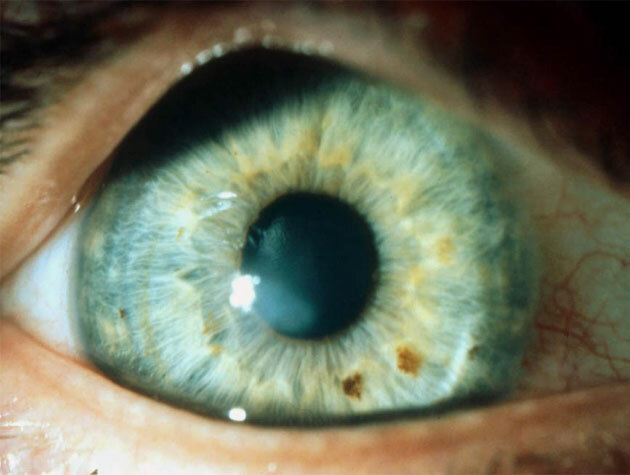 In early forms of the disease, there may be no obvious finding on slit-lamp evaluation and the diagnosis is made by computerized videokeratography only. Keratoconus typically starts at puberty and progresses into the mid-thirties, at which time progression slows and often stops. Between the ages of 12 and 35, it can arrest or advance at any time, and there is no way to predict how fast it will advance, or if it will advance at all. In general, young patients with advanced disease are more likely to progress to the point where they require of surgical intervention. Keratoconus may occur in one eye only, initially, but it most commonly affects both eyes, with one eye being more severely affected than the other. Both males and females are equally affected, and there is no ethnic predilection, although in some parts of the world, such as New Zealand and in certain parts of Finland, there is a higher incidence due to genetic factors. Despite millions of dollars being spent on the study of keratoconus, no one truly knows the cause of the disease. There have been many interesting theories but none of them have been proven conclusively, nor have any of them been consistently reproduced by multiple research groups. For example, one theory suggests that there is deficient collagen cross-linking caused by free radicals, but there is no scientific reproducible evidence to support such a theory. Others suggest that eye-rubbing causes the progression of keratoconus. However, the evidence for this is anecdotal, based on several case reports, but again there is no reproducible scientific evidence to support this theory. Our research group was the first to demonstrate that genetic factors play a major role in the development of keratoconus (Wang Y, Rabinowitz YS, Rotter J, Yang H. Genetic epidemiological study of keratoconus: evidence for a major gene determination. 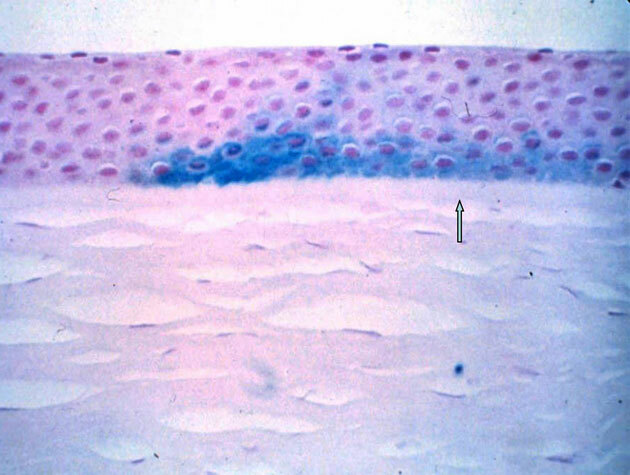 American Journal of Medical Genetics 93:403-409; 2000) Although our scientific-based evidence supports a role for genetic factors, this does not mean that if you have a child with keratoconus the child will necessarily develop the disease, because only 13–15% of keratoconus patients have a family history of keratoconus. It does mean, however, that genes play a role in its development, and that in order to provide a medical cure, the genes that contribute to the development of keratoconus have to be identified and either replaced or suppressed. This is the only potential hope for a permanent cure to stop progression of keratoconus and ensure the cornea will no longer continue to thin. 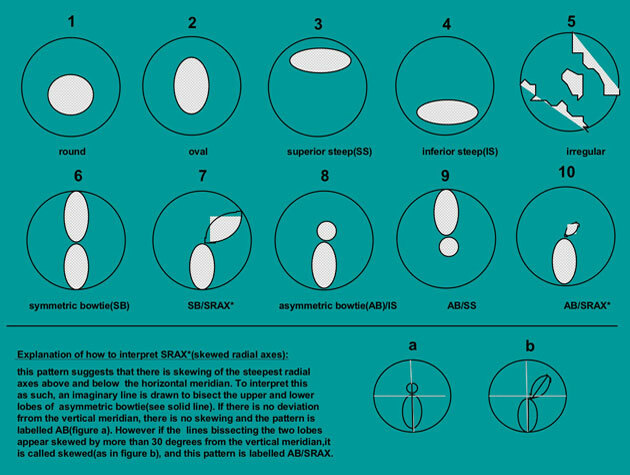 For a comprehensive scientific review on keratoconus read the PDF version of the following article: Rabinowitz Y. S. Keratoconus: update and new advances. (Major review). Survey of Ophthalmology. 1998: 42:4:297- 319. The cause of keratoconus is still a mystery, but it is likely that it is triggered by genetic, environmental, or cellular factors. Vigorous eye rubbing might contribute to progression of the disease and should be avoided, although there is no scientific evidence regarding this. One theory suggests that deficient collagen cross-linking caused by free radicals contributes to keratoconus, but this has not been supported by scientific evidence. The first symptom of keratoconus is usually blurring of vision, which prompts a person to go to the doctor seeking corrective lenses for reading or driving. At this stage, the symptoms are no different than for any other refractive problem of the eye. 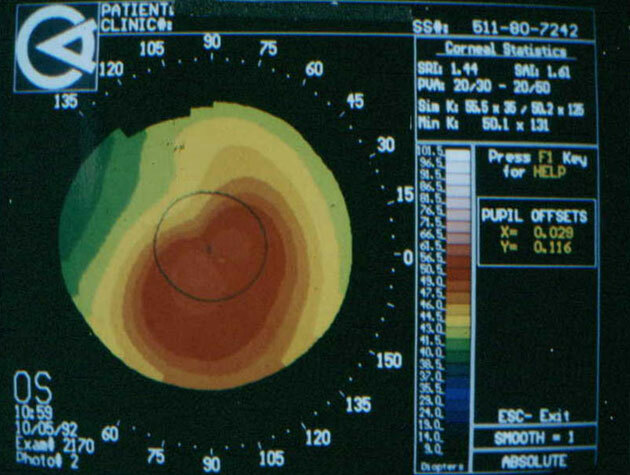 However, vision deteriorates as keratoconus progresses, sometimes rapidly. Vision becomes worse at all distances; night vision can be quite poor; vision may be worse in one eye; sensitivity to light can develop; eye strain from the effort to read can occur; and there may be itching. The condition is not painful. Another symptom is seeing multiple “ghostly” images. Instead of seeing just one image, a person with keratoconus sees many images of the same thing spread out in a chaotic pattern. This pattern does not usually change from day to day, but over time it often takes different forms. People might see streaking or flaring distortion around light sources, or notice the images moving relative to one another in time with their heartbeat. If keratoconus is suspected, the eye physician will use special tests to diagnose the condition and take a medical history, including any family history of eye disease. An examination using an eye chart with progressively smaller letters will be used, and the physician will perform an examination of the eyes. 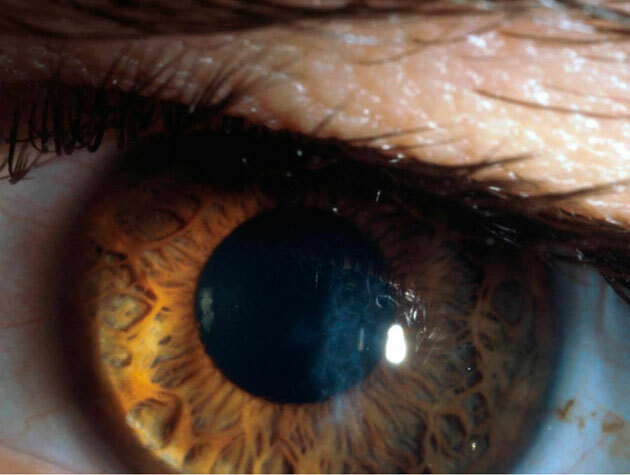 The cornea will be examined to detect irregular astigmatism that might suggest the possibility of keratoconus. If necessary, further testing will be done. The diagnosis will also include a determination of the degree of curvature of the cornea. 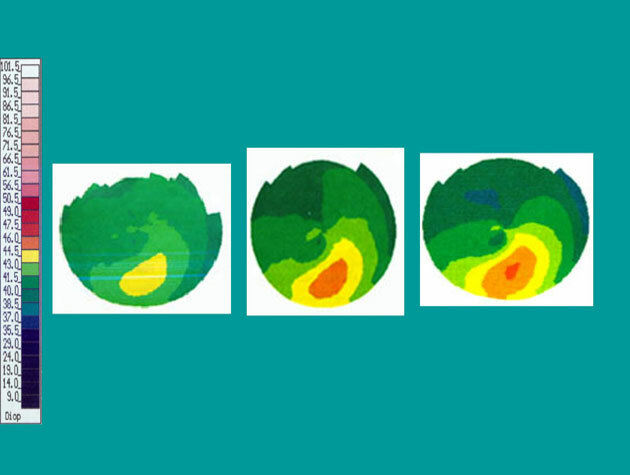 This testing method creates highly-sophisticated computerized maps are often used to confirm the diagnosis of keratoconus. Doctors at Cedars-Sinai have developed highly sophisticated software to aid in the diagnosis in patients clinically suspected of having the disease. The research group at Cedars-Sinai was also the first group to present scientific evidence supporting the role of genetic factors in the development of keratoconus. 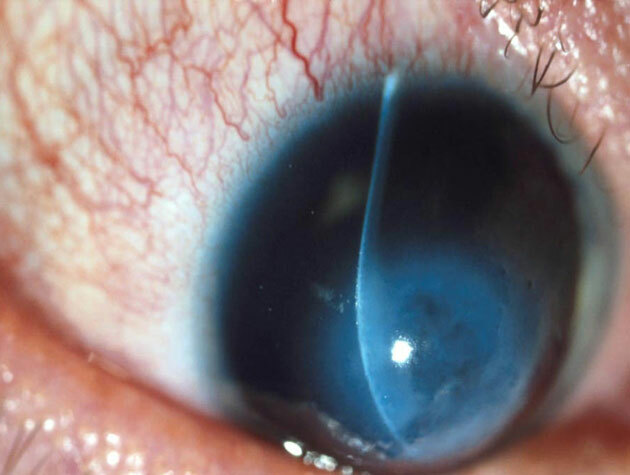 These findings suggest that in order to develop a medical cure, genes contributing to the development of keratoconus will have to be identified and either replaced or suppressed. The Keratoconus Genetics Research Program at Cedars-Sinai is such a program. Our scientists are trying to develop a medical cure for keratoconus. The program is conducted by Yaron S. Rabinowitz, MD, Principle Investigator, Cornea Specialist and Opthalmic Geneticist; and Martha Bucaram Research Coordinator. 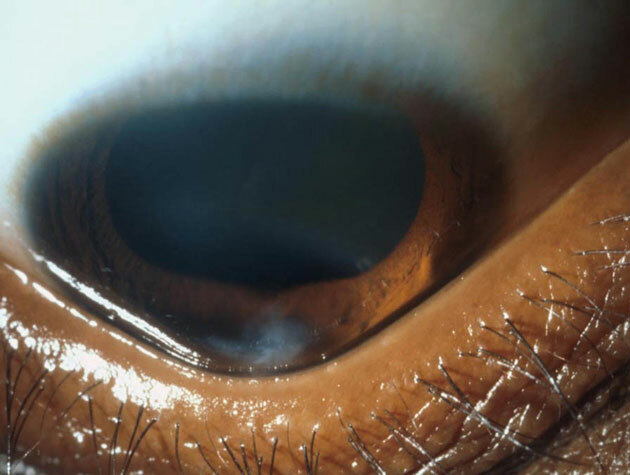 Central corneal edema seen in a patient with "hydrops"